The alpaca is native from the South American Sierra of Los Andes. For 7,000 years, alpaca has been living at 4,500 meters above sea level, where temperatures can reach 30ºC below zero. At the bottom of spectacular snowy peaks, these animals have been domesticated by Andean shepherds. The ancient Inca civilization considered it a treasure for its economy and its fibre was reserved only for its royalty. Nowadays, its fibres and fabrics are appreciated around the world and this still generates a significant value to the economy of the region. They are kind, cheerful, intelligent and curious animals. They do not destroy their environment: they only eat the tender shoots of herbs and plants so that their roots continue to regenerate. Therefore, they are eco-friendly. Also, the use of its fibre promotes sustainable agriculture in the Andes. Alpaca’s fibre produces more diversity in its colours than another camelid. Today we can find more than 22 different natural colours. Its fibre does not contain grease, lanolin or environmental pollutants. It is hypoallergenic and it can be cleaned with soaps that do not contain strong chemicals, protecting consumers, producers and the local ecosystem. Its fibre is softer than cashmere and warmer and lighter than sheep’s wool. It does not retain moisture and it is able to keep natural body temperature thanks to the fact that its hair contains microscopic air bubbles on the inside. These bubbles keep the garment fresh during warm days and retain body heat on cold days. Its resistance causes the piece to not deform or change its shape over time. “We want the qualities of the alpaca to be known. Its breeding does not damage the environment and respects the rules of sustainable development”. The Peruvian Andes is where the world’s largest production of alpaca fabric takes place. There are more than 4 million that are raised freely at a height of more than 4,500 meters. Its fibre, which has more than 22 natural tones, is exported to the United States, Europe and Asia, attaining visibility in runways around the world and growing in the luxury fashion consumption. The flat fabric of Alpaca Suri and baby Alpaca is similar to wool in appearance. It contains two strands with regular twisting and the visual result is a soft cloth with good sag. The differentiation factor between the vicuña fibre and the other camelids is the fineness of its hair, measured in microns, which later translates into a difficult spinning process. This animal only produces 200 grams of fibre every three years and, in order to respect and preserve individuals and the environment, the shearing in the same animal cannot be repeated for three years. The Vicuña offers very long and very fine fibre. Its colour is brown but the shades of it can vary significantly. The Vicuña is very elegant in its movement. During the day, it stays in the plains, but at night it moves on the slopes of the Andes. It can live in cold temperatures of night time, although its fibre is very thin. Its body lets it capture the heat of sunlight during the day on its skin and keep it warm at night. Unfortunately, the Vicuñas were hunted almost to extinction in the late 70’s due to their very valuable fibre. 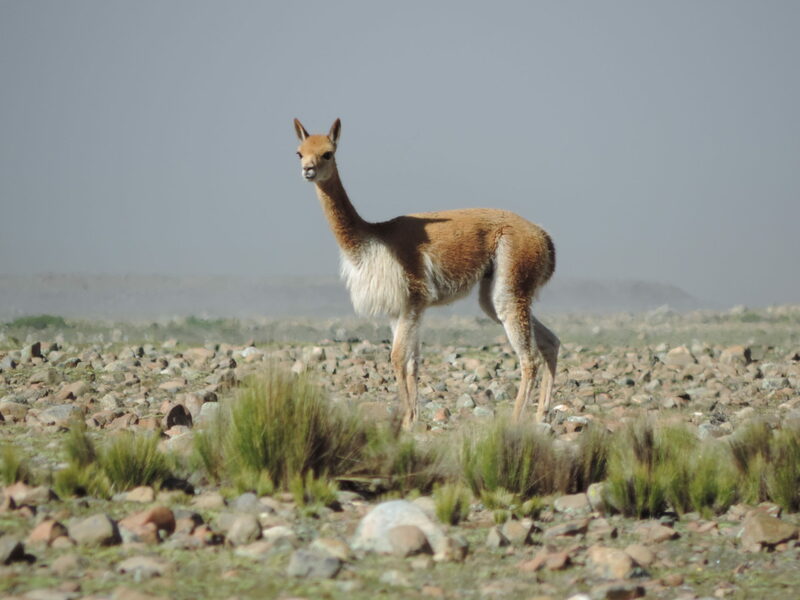 The conservation and preservation efforts of Argentina, Bolivia, Chile, Ecuador and Peru have led to a phenomenal resurgence in vicuña populations. Nowadays, vicuñas can be found in healthy numbers in the Andes. Its fibre does not contain grease, lanolin or other environmental contaminants. It is hypoallergenic and it can be cleaned with baby shampoo that does not contain strong chemicals, protecting consumers, producers and the local ecosystem. It is important to emphasize on the fineness of the fibre because this means that, when combined, an exceptional heat capacity is generated. And also, there is an essential additional advantage: its weight is minimal. The vicuña fibre is the most exclusive and expensive fabric in the world. It is used in the luxury textile industry to make scarves, shawls, jerseys and some other jackets or coats. Normally, none of these last two products are built with hundred percent vicuña wool because of the low production of its fibre, its complicated handling and its very high price. Its fur makes each piece something like a rough diamond. Its fibre is characterized by having a Vicugna or beige colour, naturally reddish.